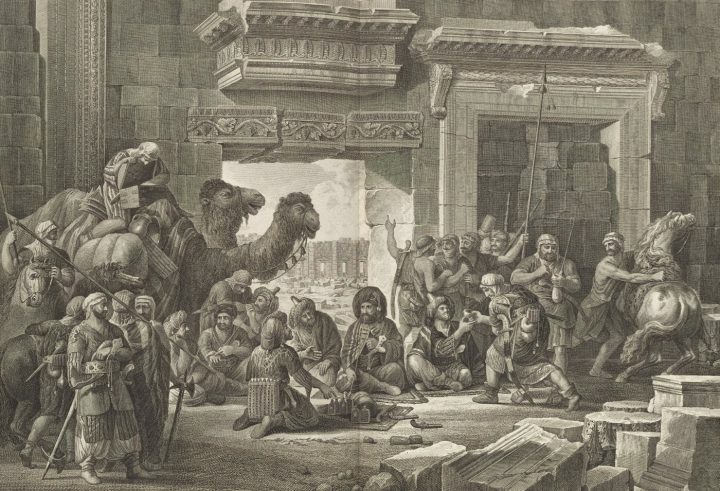 A new online exhibition on the ancient Syrian city of Palmyra by the Getty Research Institute forgoes the city’s historical complexity to take an Orientalist approach. In news and commentary on the Syrian Civil War, few places have attracted as much attention as the city of Palmyra (Tadmur in Arabic). Taken by the Islamic State in Iraq and Syria (ISIS) in 2015, to become the scene of executions of residents and the destruction of antiquities, and then retaken dramatically by Russian and Syrian government forces in March 2016, Palmyra has been a constant topic of discussion around the world. Against this backdrop, the Getty Research Institute’s (GRI) first online exhibition, The Legacy of Ancient Palmyra, announced just days before ISIS recaptured both the ancient ruins and the adjacent namesake modern town in December, is poignantly relevant. The pairing of these two artists in this exhibition is inspired. While they may have been chosen primarily because they are owned by the GRI, the images of Cassas and Vignes raise several important questions about Palmyra and how we view it. We can see how the state of the ruins and the town changed over a period of 80 years. We encounter two Frenchmen whose work is largely unknown, especially in the English-speaking world — where they are overshadowed by William Halifax and the merchants of the British Levant Company who “rediscovered” the site in 1691, and by Robert “Palmyra” Wood and his 1753 publication The Ruins of Palmyra. We can compare images of the city in these two different media to see how their differences affect the way that each artist presents the site. Simon Charles-Miger after Louis-François Cassas “Louis-François Cassas presenting gifts to Bedouin sheikhs” (1799) etching, plate mark: 8.4 x 16.1 in. The exhibition is well organized; the layout is attractive, the images stunning — Cassas’s drawings populated by artificially composed groups of people, Vignes’s photographs silent and empty of figures. In addition to these two men’s works, the curators provide a well-chosen selection of other images: views of the site by different artists, scenes of modern excavations at Palmyra, photographs of funerary busts and other artifacts. The accompanying text is particularly successful in presenting the classical city and its monuments, as well as describing how publication of images of those monuments helped influence the growth of neoclassical style in the mid- to late 18th century. 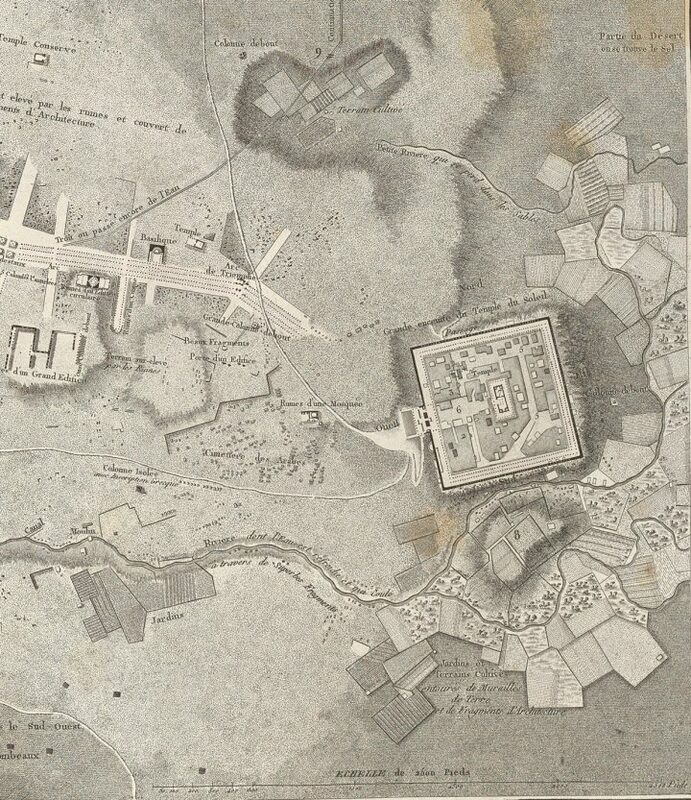 Louis Perrier after Louis-François Cassas, “City plan of Palmyra” (detail of area of modern village) (1799) etching. plate mark: 26.3 x 18.5 in. Of special interest is the fascinating and valuable light that Vignes and Cassas shed on the modern village of Palmyra. The ancient site was never abandoned. Reduced to a village centered on the Temple of Bel enclosure, it continued to be inhabited up to the early 1930s, when the inhabitants were relocated to make way for more extensive excavation of the temple. (This was the beginning of the modern town of Palmyra adjacent to the ruins.) 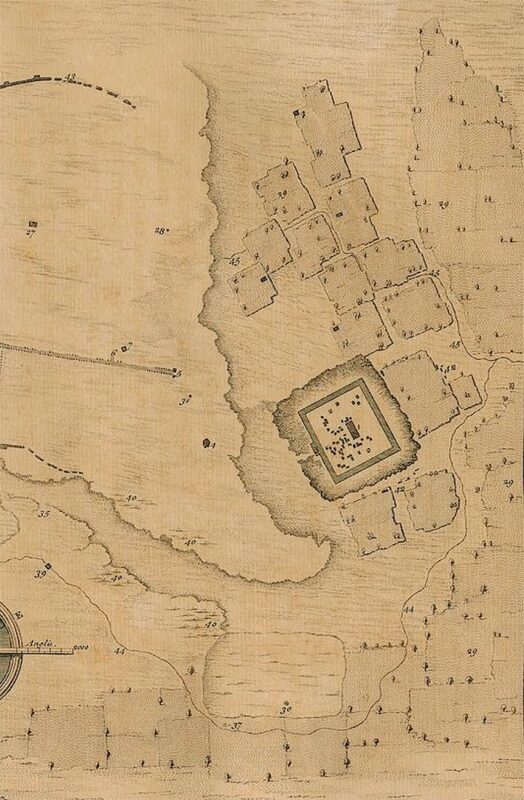 Cassas’s plans of the overall site and of the Temple of Bel enclosure provide a great deal of information on the village in the late 18th century. 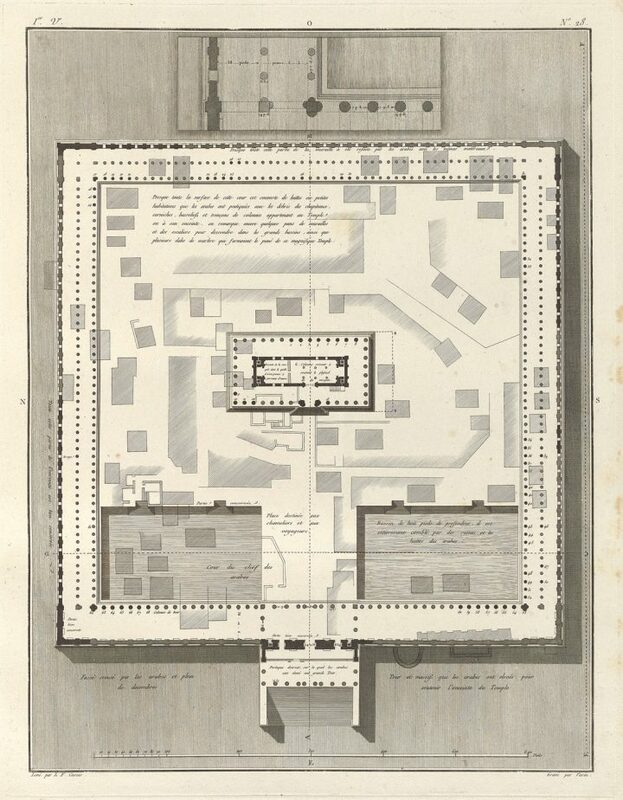 The modern features of the site were often ignored by Western travelers, though some of them are noted on the site plan drawn by Giovanni Battista Borra that accompanied Wood’s text. We see the surrounding land used for fields and gardens, a cemetery, a (ruined) mosque, and a mill. (Borra’s plan has the same basic features but with less detail, and less accuracy.) 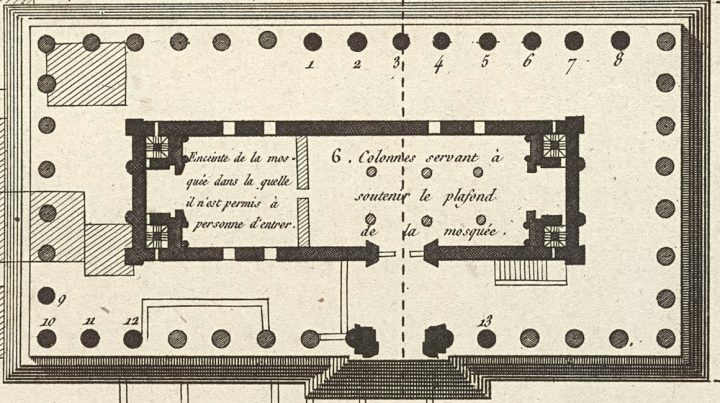 Cassas’s Temple of Bel plan includes several elements of the modern village that are otherwise hardly known. His lengthy manuscript on Palmyra, also acquired by the GRI, provides unique possibilities for further research into the 18th-century village as well as into his own attitudes towards the ancient site and its modern successor. But most of these insights are ignored by the exhibition. Instead, by omitting almost all discussion of the modern village, and of post-classical Palmyra generally, the exhibition makes Palmyra’s legacy solely about modern European and American interactions with it. Indeed, it was people like Cassas and Vignes who (we are told) were responsible for “creating Palmyra’s legacy.” Modern interpretations of Zenobia, Palmyra’s famous third-century queen, are cited exclusively from European and American literature, with no mention of the similarly vast body of Arabic novels, operas, plays, and television programs about Zanūbyā or al-Zabbāʾ. Vignes and Cassas are called out for ignoring that the cella (inner sanctuary) of the Temple of Bel served as a mosque in their day, even though Cassas comments on the mosque clearly in his plans. Meanwhile, the exhibition mentions the use of the cella as a mosque only one other time — while implying that the temple was turned directly into a mosque, when in fact it had first served as a church for hundreds of years. So we must ask: who is ignoring the uses of this building? More than passing over this history in silence, the exhibition actively reproduces many of the Orientalist stereotypes of the site from the last 300 years of Western engagement: narratives of “decline,” ruins frozen in time “for over a thousand years” (even though regular modern activity in the 18th century extended over at least one-third of the site). The classical form of the Temple of Bel is said to represent its “former perfection,” while its medieval fortifications and modern, mudbrick houses reflects a “raw view of the site.” Fifteen hundred years of post-classical history are reduced to a brief parade of conquerors as we progress quickly from Palmyra’s glorious ancient past to its heroic Western rediscovery. The exhibition does briefly address these sorts of problems in discussing the late 19th to early 20th century collecting and looting of artifacts by European and American visitors to Palmyra. These practices broke Ottoman antiquities law, and from our current perspective, violate accepted ethical norms — among other things, they encourage further looting and forgery. But the GRI presents artifact looting as a controversy with two compelling sides. It takes seriously the dubious argument of “saving” ancient artifacts, despite the long history of reliance on this argument to justify theft and violation of antiquities laws. This is ironic, given that the GRI is part of the Getty Trust — which includes the J. Paul Getty Museum, with its own history of dubious acquisitions (purchasing items stolen from other countries or items with questionable provenance). 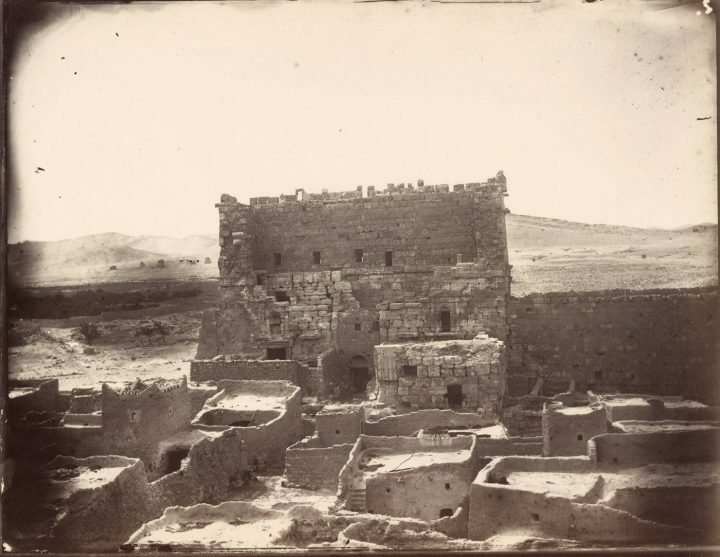 While the Getty Museum is known for collecting only Western art, the GRI is responsible for extensive research and publication on material from other parts of the world, including a critical look at Orientalist photography. So it is more than a little surprising that the first GRI online exhibition should be an Orientalist one: a Syrian city reimagined as the heritage of its European visitors. The Legacy of Ancient Palmyra gives us only one legacy of this city. There are other legacies too: the post-classical city, which thrived as a trading center for hundreds of years; the removal of the modern inhabitants and destruction of their village in the 1930s to make way for archaeologists; the modern town of Palmyra, with tens of thousands of people who have suffered greatly, killed or displaced by ISIS, many of their homes destroyed; the infamous Tadmur Prison; the Orientalism of Western explorers; the propaganda of the Syrian state. These are mostly ignored. Many, many articles over the last two years have dealt with the classical city and its Western inheritance, but other aspects of Palmyra are discussed rarely, and usually in less prominent outlets. 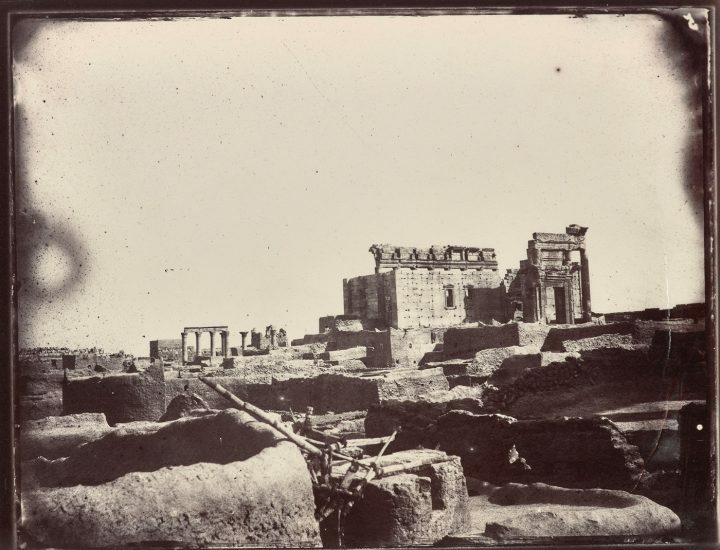 One noteworthy exception that deals thoughtfully with Palmyra’s complicated pasts is Ingrid Rowland’s New York Review of Books essay from September 2016, surveying the Getty’s own Vignes photographs. 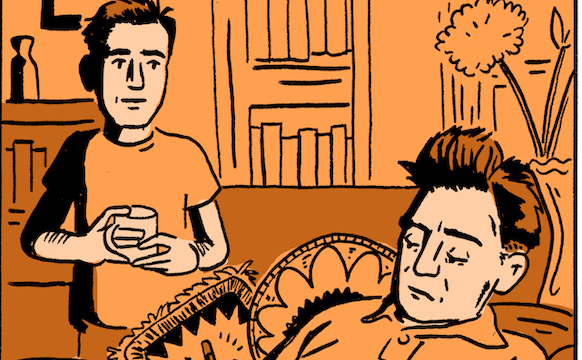 More than anything, the GRI exhibition represents a lost opportunity. But things may change: Claire Voon reports that the curators are planning updates to the exhibition, including a translation and redesign for readers of Arabic. Perhaps there is time to address more of Palmyra’s varied legacies, alternately rich and heartbreaking. The Getty Research Institute’s first online exhibition, The Legacy of Ancient Palmyra, launched earlier this month. It will continue indefinitely.